Just after rain hours before dawn a moth flutters against the screen wanting to come in and you and the moth slowly turn into water as you listen and hear the trees dripping just after rain in beads that fall with reverence before the dew comes as another shade of water lighter than the smoke of what went out in your heart long ago, and it’s your heart that listens, that hears beyond sound and the power to name, your heart that wants to know what to do with this tenderness, this trembling that presages all caresses and the night air so soft coming through the window just after rain as the moon appears behind the breath of trailing cirrus, bright surprise and chalk of wonder, another sigh, another whisper late at night just after rain and you listen for the flowers holding their bells and trumpets in rapt abeyance for day’s commencement in shining, little instruments, little strings waiting to turn sunlight into blossoms, into symphony and just after rain you think of dying, of fading away to pure spirit or smoke and dying after rain like a dark doorway with no keyhole or door jamb, no door even, intimation of door like a candle flame that beckons you to greater silence and just after rain the one lying beside you lost in dreams, soporific, in another world dreams choose as chamber-most to spirits, spirits which are everywhere and always though you need to be a sleeping child again to feel them just after rain and the world washed clean again for the power and the glory and the mercy that is listening and not knowing, that is this hush of stillness just after rain where you dwell in blessed simplicity, also listening, also audition for what would raise you up to starlight in the brightness that beseeches asking you to leave your skin behind, not duty bound or correctional but oracular, sweet utterance that can only spoken in listening just after rain and just after midnight, just when you felt you could not keep going, could not quell the ache that resides somewhere in your body where the truth of every longing lives, just after rain when you were sure you did not have anything left to give, when you thought it was over, when you thought you were old and felt the dark gates closing, when the one you lost and the one you love isn’t coming back and no way to gainsay beloved’s departure, when longing was your tattered coat and longing was your ticket to nowhere, when hush was a command and not an invitation, when starlight again so bright casts its many pins into a darkness without measure, only dark, only night and yourself listening just after rain which will somehow save you, showering miracle unbearable to fathom because it is bottomless and partakes of the vastness that makes all here and there possible, via negativa also bounty and deliverance, door-like opening that is no door and no room just after rain, and rain itself that fell like silenced voices moments ago and the wind in the trees to tell the rain not to forsake their growing leaves and branches, the viscous sap within whose lifeblood is shot-through with forever and the spiraling rings of years, rain in the forecast and rain a way to foretell events to come, rain foremost on farmers’ minds like a haunting dream of water they can’t get shut of, just after rain and the light of one candle, one consciousness that is yours connected to all others everywhere in the world, just after rain in Bangladesh and just after rain in Omaha steaming off the cement streets downtown on Farnham Street and just after rain in Moscow near the Orthodox churches and just after rain in Singapore, a brief shower that ended around 2:00 a.m. somewhere in Montana and Phoenix dying of thirst, all the gullies and arroyos outside of town close to flooding and desert flowers suddenly blooming even as they drown and just after rain in foggy London, in Bravaria, Uganda, on a front porch in Alabama and John Coltrane playing “After The Rain,” which shimmers in recording, in after echo whose prominence is prayer incarnate in sound, in water, in all this falling, in the love that will not end and the love that weeps privately in a room anywhere, professional mourners or first-time amateurs, their hearts broken like bread that’s been baked in a stone oven, needing the weeping to soften and become wheat again, waving in a field in Kansas with windmills turning clockwise just after rain before another rain sweeps in. 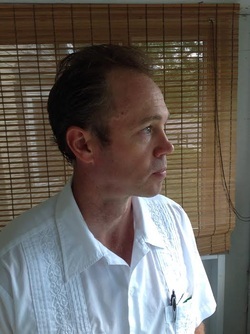 Robert D Vivian is the author of The Tall Grass Trilogy, Water And Abandon, and two collections of meditative essays, Cold Snap As Yearning and The Least Cricket Of Evening. He's currently at work on a collection of dervish essays.